Do you enjoy pushy salespeople? Are you looking for an overpriced and under-serviced hot tub? If so, look no further than a traveling spa expo. These traveling spa shows are notorious for making a quick buck and leaving their customers high and dry. Their promises of hot tubs and swim spas up to 40 – 80% off might sound appealing, but you know the old saying “You get what you pay for”? Well, that statement couldn’t be more true. In terms of product quality, service, and delivery, the grand promises of a hot tub show usually fall short. We know this because our team is who the victims of these expos call to help them when they are in a pinch. We’ve seen it all- From cheaply-made hot tubs needing immediate service, to customers thinking they’re getting the whole package (cover, cover lifter, and steps) and only getting a spa delivered to their driveway (keyword: driveway, not their backyard or designated placement area). You need to be extremely wary. 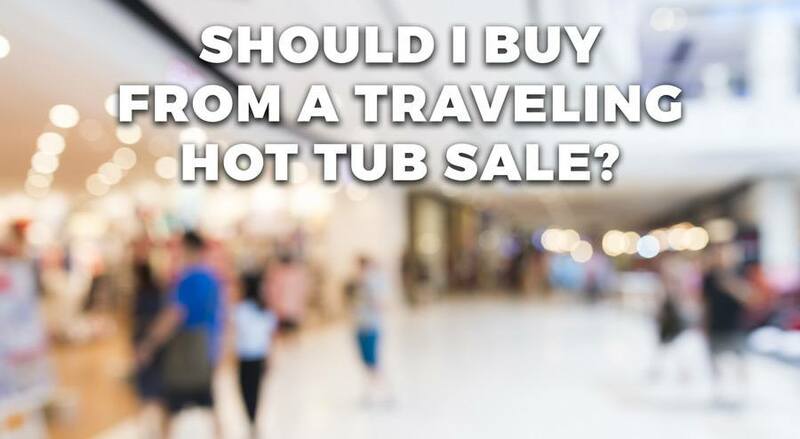 We rounded up a few of the top reasons you should buy local vs purchasing from a traveling hot tub expo. Local Service – Anyone who has ever owned a hot tub will tell you that having an experienced team of professionals supporting your purchase for the lifetime of the spa is incredibly important. Not only will you need someone to lean on should any needed repairs arise, but you will also need professional advice and assistance in ongoing hot tub maintenance. Typically, a traveling hot tub show is based out of a different part of the country and will not offer any local service. Partnering with a local dealer will ensure you’re not left high and dry when you have questions about replacing your hot tub filter, cleaning your spa, repairs, or need help troubleshooting your hot tub chemicals. Product Quality – If you partner with a traveling spa show over a local retailer, it also means you have little recourse if you find the quality of your spa is not up to par. These traveling expos do little to ensure product quality, and since they’re not on the hook for local service should the spa stop working, they have little skin in the game. Whether you’re partnering with a local dealer or traveling expo, always do your homework. There is a wealth of information about the different hot tub brands and models online- Make sure you’re choosing a spa that has been proven to be a quality product. The Art of the Deal – These traveling spa shows live and die by the strength of their salespeople. They don’t have time to let you go home and sleep on your decision, so they often employ incredibly pushy sales tactics that make you think you need to act immediately in order to get the steal of the century. In reality, these deals might not be what you think they are. We encourage you to shop these deals around to local retailers. You might find sales at local stores are comparable or you may even find a local dealer willing to match the “deal” in competitive value and value adds. Hot Tub Delivery & Installation – This is a big one. These traveling shows are typically only in town for a weekend, so they must deliver your spa immediately and move on to the next city. It takes time, planning, and preparation to ensure safe delivery of your hot tub and proper installation. Is your site prepared? Do you have the appropriate electrical outputs ready for action? Is your backyard or designated area easily accessible? If the answer to any of these questions is ‘no’ then you should rethink your potential purchase from a traveling sale. Most of these companies will simply deliver your hot tub to your driveway and no further, leaving you to figure out the rest. We understand the appeal of these traveling hot tub shows, but peel back the layers and you’ll often see these glitzy deals for the subpar values they really are. Don’t risk dissatisfaction and headache down the road. Partnering with a reputable local dealer will pay off in spades. Not only will you be confident in the quality of your spa, but you’ll take home the invaluable peace of mind that you’re investment will run properly for years to come. Creative Energy has been the Bay Area’s hot tub and swim spa dealer for over 40 years. It’s our mission to be the top spa dealer and service provider in the world. We accomplish this by retailing only the highest quality spas in the industry while maintaining the most knowledgeable, dedicated team of professionals. Browse our wide selection of Hot Spring Spas available at our San Rafael, San Mateo, and Pleasanton showrooms today.